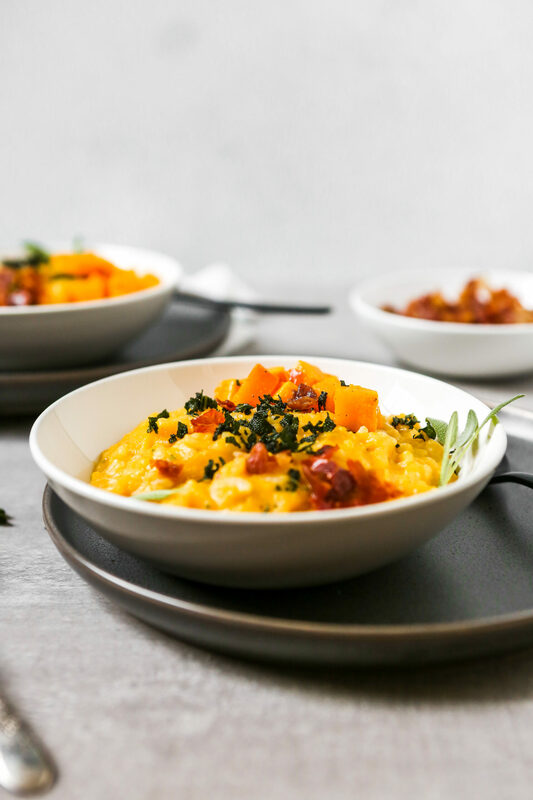 This creamy Roasted Butternut Squash Risotto is the perfect fall dinner. 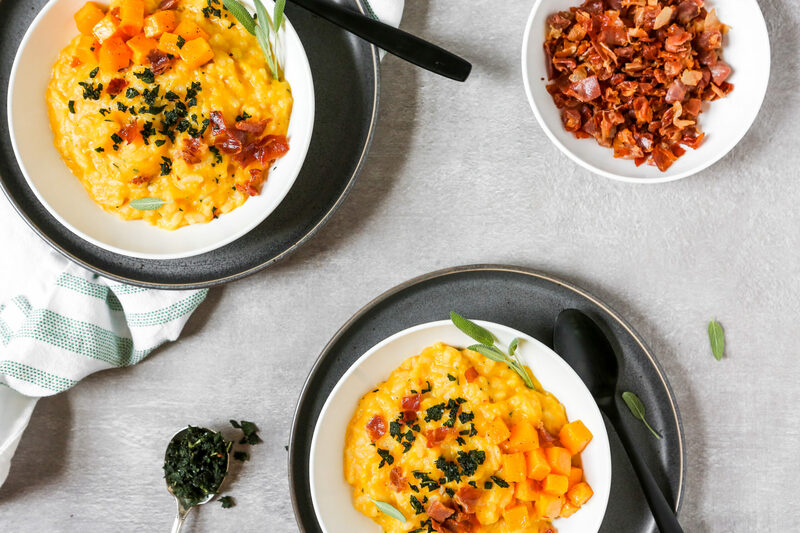 It’s warm and comforting, made with a roasted squash purée, and topped with crispy fried sage and frizzled prosciutto. Risotto is inherently creamy, thanks to the type of rice that’s used and how its cooked. If you’re interested, I talk more about the basics of risotto in this article. And if you thought risotto couldn’t get any creamier…well you haven’t had a risotto like this. 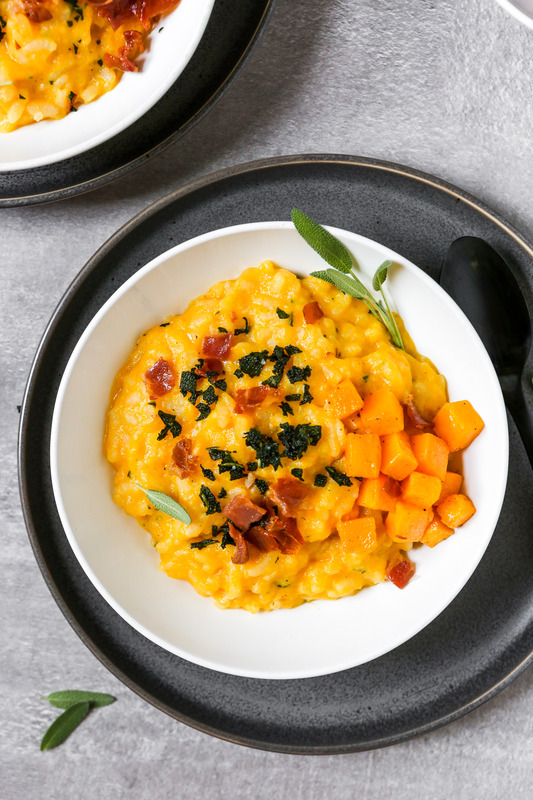 It starts off like any traditional rice-based risotto but gets finished with a wine-laced roasted butternut squash purée. Yes. It’s absolute heaven. But even the creamiest risotto isn’t complete without a crispy garnish. And for this recipe, fried sage and frizzled prosciutto finish the job nicely. I highly recommend not skipping them. 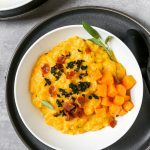 Is butternut squash risotto healthy? I frequently got this question as I shared my recipe development process for this recipe and the Sorghum Risotto on Instagram. And here’s the thing, in general risotto falls right between being healthy and indulgent. Why? Well although risotto is made with whole-grain rice, the type of starchy rice used is low in fat and fiber, high in carbohydrates, and fairly low in protein. So not much more than just carbs. However, because so much starch is released from the rice during cooking, high-fat ingredients like cream and butter aren’t needed to create a creamy, decadent consistency. Most recipes do call for Parmesan cheese which adds essential savory, salty flavor as well as some fat. 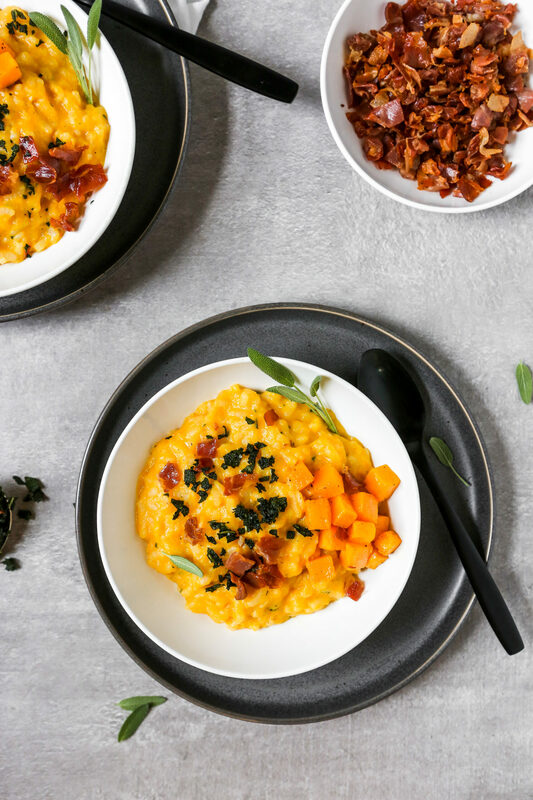 Compared to other risotto recipes, this Butternut Squash Risotto is on the healthier end of the spectrum. 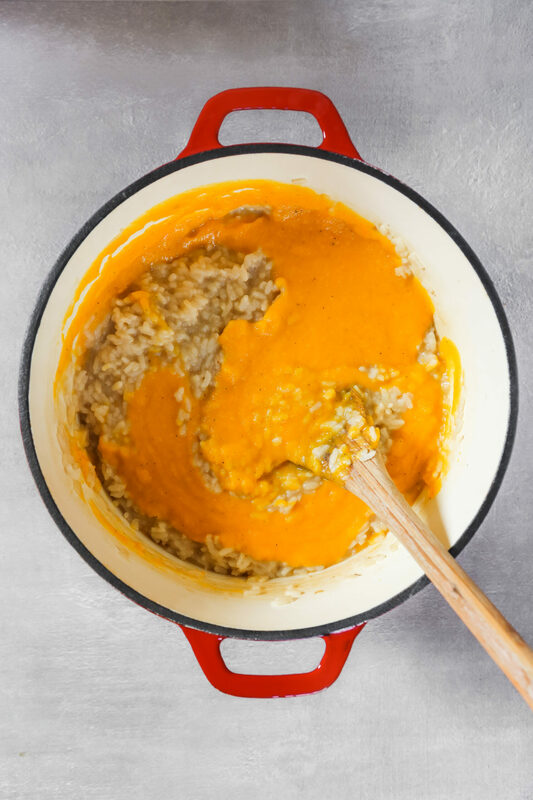 Made with quite a bit of puréed squash (high in vitamin A and C, and moderate in fiber), heart-healthy olive oil, and just a tablespoon of butter makes this risotto a wholesome choice when you’re looking for something warm and comforting. 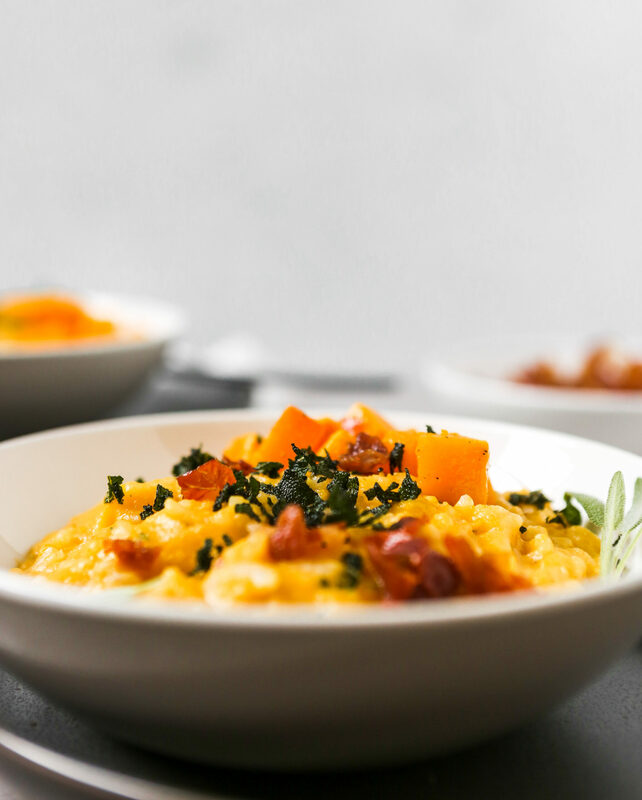 What goes well with butternut squash risotto? 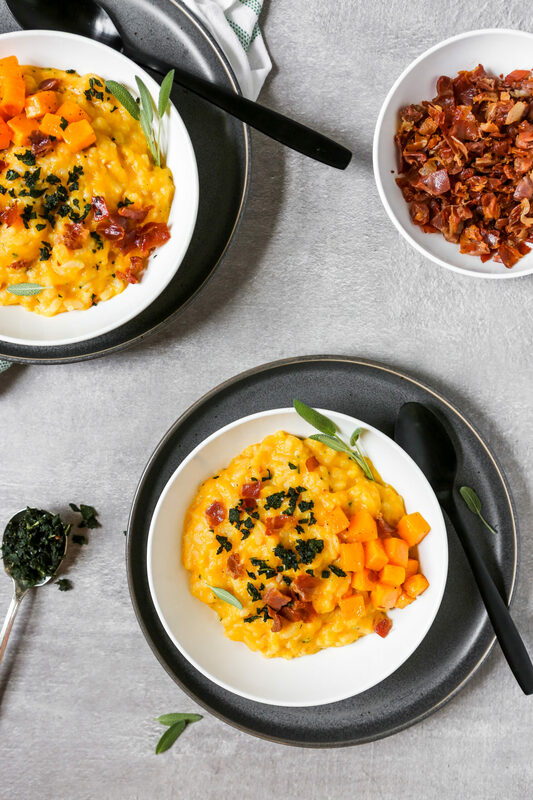 A fall-inspired risotto like this pairs well with roasted vegetables like broccoli and brussels sprouts, sautéed green beans, or a kale salad with a fall/winter fruit like apples or pears. Typically, most risottos are made with a splash of dry white wine. And since the bottle is already open…I like to serve risotto with the same wine used for cooking. However, this risotto also pairs well with a robust, dry red wine like Cabernet Sauvignon, Shiraz, Zinfandel, and Grenache. But…if you’re looking for a complete menu this Cozy Fall Dinner Menu is a must-try. 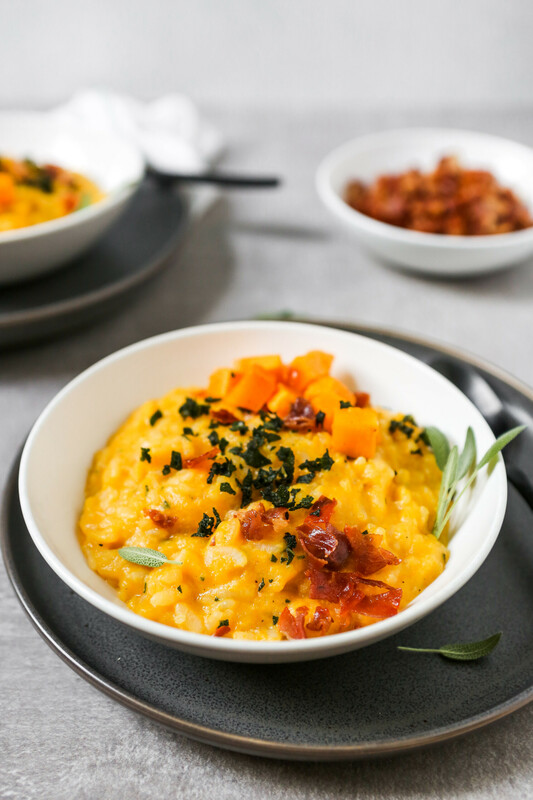 This creamy, butternut squash risotto is easy to make, cozy and comforting! Just what you need to stay warm! Toss squash with 2 tablespoons oil and season with salt and pepper. 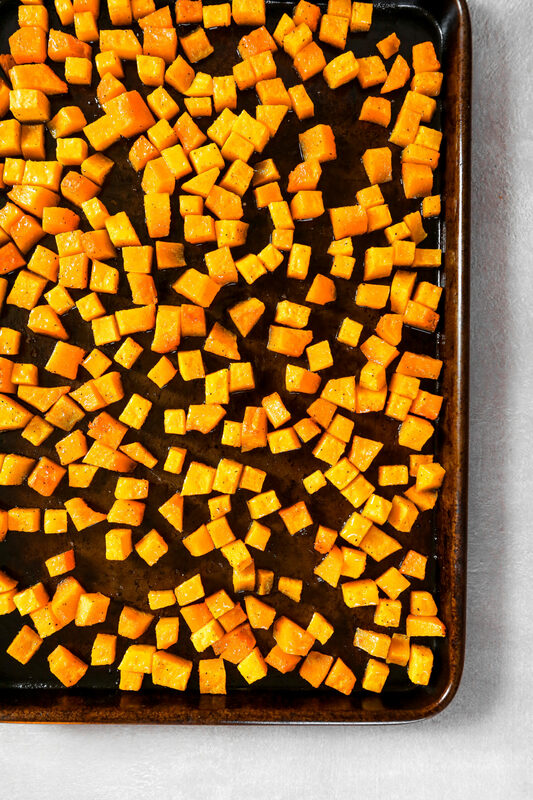 Arrange squash in a single layer on a baking sheet and roast until fork-tender, 20–25 minutes. Reserve ½ cup roasted squash, then transfer remaining squash to a high-powered blender or food processor. Add wine, ½ cup broth, and turmeric to blender and purée; season with salt, pepper, and nutmeg and reserve. Heat remaining 5½ cups broth in a saucepan. Bring to a simmer, covered, over medium-low. Heat butter in a Dutch oven or stock pot over medium. Add shallots and cook until softened and translucent, 3 minutes. Add rice, and cook, stirring constantly, until edges start to become translucent, 3–4 minutes. Stir 1 cup warm broth into rice, and cook, stirring constantly until liquid has been absorbed, 1–2 minutes. Stir in remaining 4½ cups warm broth, reduce heat to medium-low, cover, and simmer 16 minutes stirring twice. Remove lid, add reserved squash mixture, Parmesan, and 2 tablespoons minced sage to risotto; stir until creamy, 3–4 minutes. Heat remaining 2 tablespoons oil in a skillet over medium until shimmering, add remaining sage and cook until sage starts to darken and become crispy 1–2 min (but not brown). Season with salt and pepper, then transfer to a paper-towel-lined plate. Cook prosciutto in same skillet over medium until crispy, 6–8 mins. Transfer frizzled prosciutto to a paper-towel-lined plate. Serve risotto with crispy sage and frizzled prosciutto.